Two decades ago, when General Mills launched its Box Tops of Education campaign, it was as simple as a shopper marketing campaign could be. After consumers bought a participating product (in those days, only cereal), they could cut out the tiny cardboard rectangle, bring it into a participating school, and redeem it to raise money for their schools. Today, the campaign occupies an entire digital landscape, demonstrating how successfully technology can be integrated into a shopper marketing approach. General Mills' campaign is no longer limited by geography or tiny pieces of cardboard. On the Box Tops for Education site, consumers can create their own account, which allows them to upload and allocate their digital box tops, track the progress of their school, and download exclusive coupons. The especially kind-hearted can even find schools across the country that they'd like to donate to, searching by location or category. For example, Round Valley Elementary School is Bishop, CA is raising money for art supplies, while Georgetown Day School in Washington, D.C. needs funds for field trips. Donating to either takes only a click. Periodically, the Box Tops portal also promotes a special sweepstake — along with a special product. 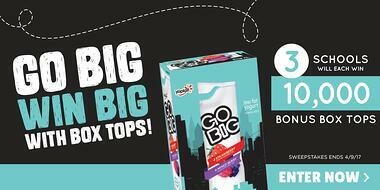 Until April 9th, visitors can enter the Go Big, Win Big contest, whose grand prize is 10,000 box tops, worth $1,000. Paired with this offer is a campaign for Go Big yogurt, which is "made with real fruit and just the right amount of sweetness." The weighty incentive is the perfect way to alert established General Mills consumers that a new product is available. 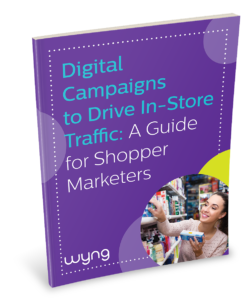 Such a broad, technologically savvy campaign reveals that shopper marketing is perfectly adaptable for the digital world. Want to know more about Shopper Marketing 2.0? Click HERE for our eBook.